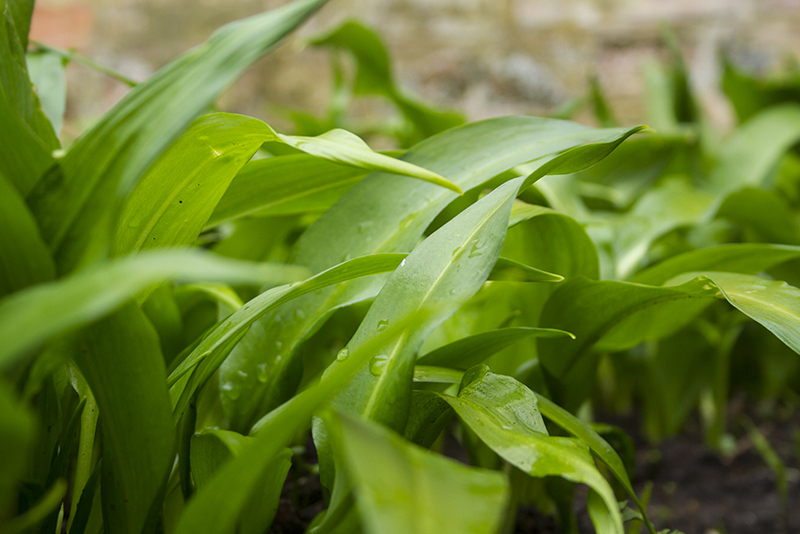 The thing I love about this rain, this totally, completely prolific rain, is that it carpets the mother-in-law’s garden with a lush verdant cover of edible treasure – namely wild garlic. This year it’s been bountiful: tiny fountains of pungent foliage, with their paper-like white buds, have scattered themselves all over the vegetable patch, filling the air with a sweet tang. Wild garlic – also known as ransoms, buckrams, wood garlic, and bear’s garlic or bear leek (for which it’s Latin name, Allium ursine, is given as brown bears just can’t get enough) – is a wild member of the chive family, and native to Europe and Asia. Historically, it has been used in various ways and I was most interested to discover its juice can be used as a moth repellent and disinfectant, and that in Switzerland, in the 19th century, cows were fed the stuff to produce garlic-flavoured butter, which was in favour at the time. 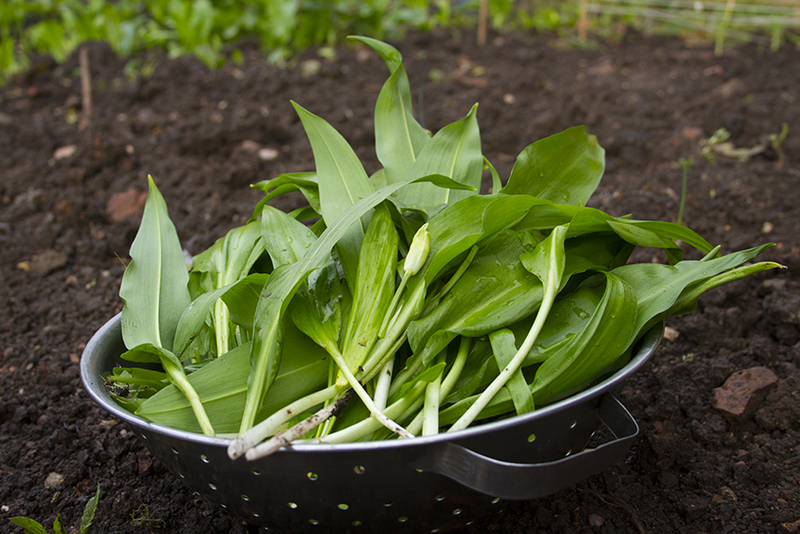 Now, sadly, farmers view wild garlic as a pest because it adds flavour to meat and dairy, which is a great shame as its natural antiviral properties could be of great benefit to livestock. 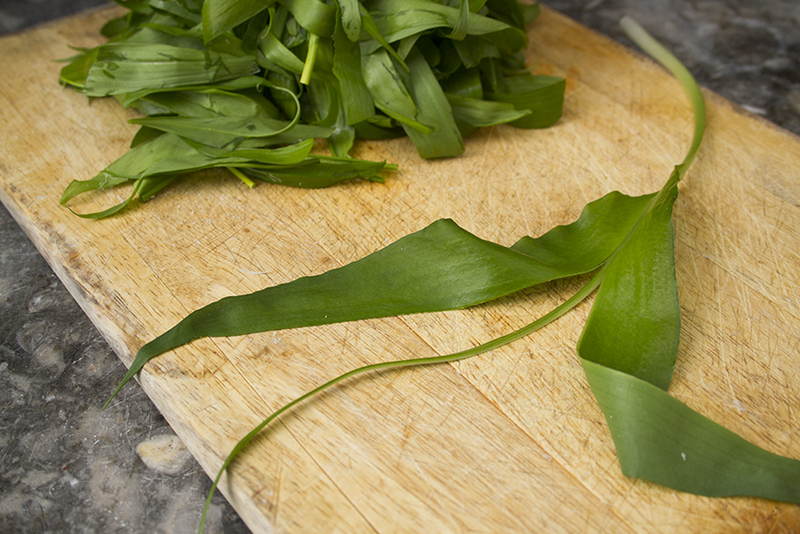 Saying this, wild garlic offers many health-giving properties when used regularly, and may relieve a variety of digestive problems (colic, indigestion, wind, diarrhoea), chest conditions (asthma, bronchitis, emphysema), and circulatory diseases, and reduce cholesterol levels and blood pressure. In fact, recent studies in Germany show wild garlic is a cut above the common garlic (Allium sativum) we all use in our kitchens, containing more magnesium, manganese and iron, and four and a half times more sulfur. 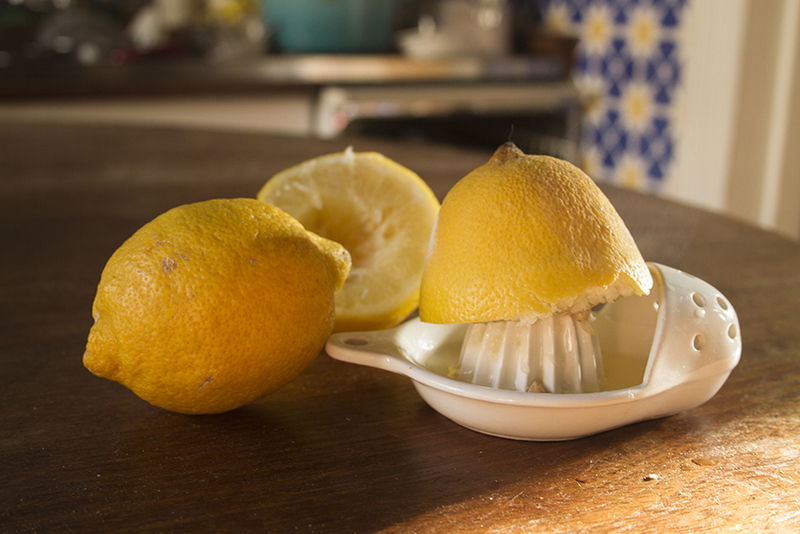 Sulfur is known to balance blood cholesterol and prevent heart disease, strokes and other arteriosclerosis disorders. Like common garlic it has antiviral properties, however, unlike its poorer relation, which leaves an odour after it’s eaten because its sulfur is bound to protein, wild garlic’s sulfur compounds are free form… so snogging is definitely in order. 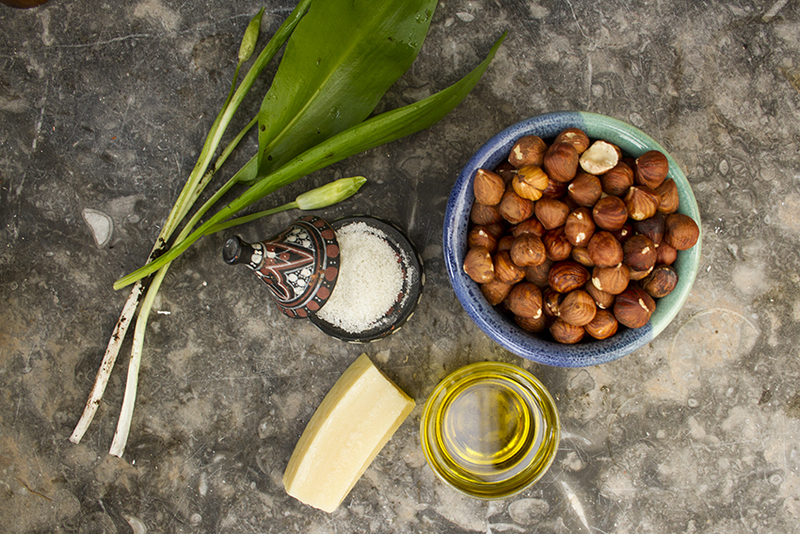 Pesto is a beloved way of using wild garlic by many a cook, and my recipe favours roasted hazelnuts (in their skins) to the more traditional pine nuts that one would use when making Italian pesto Genoese. 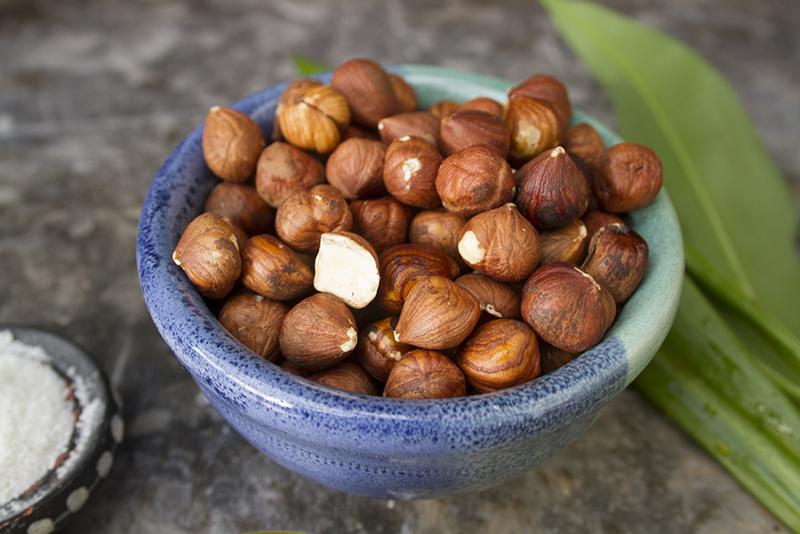 In her wonderful book, ‘The Flavour Thesaurus‘, Niki Segnit points out that, “research has shown that the key hazelnut flavour compound increases tenfold when the nuts are roasted“, and here roasted hazelnuts harmoniously balance the mildly fiery wild garlic with their nutty, buttery sweetness. Stirred into freshly cooked pasta, it offers the taste of a just rained-upon woodland in spring with all the financial perks that foraging offers. I mean, there’s nothing quite like digging through the undergrowth and picking your own food, especially if it means avoiding the supermarket and its expensive, plastic-wrapped flaccid bunches of basil. 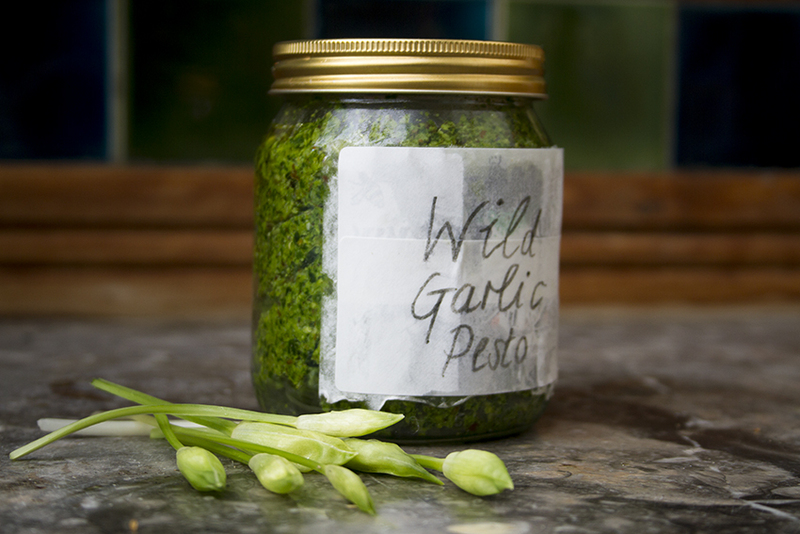 Wild garlic is an excellent ingredient with which to start your foray into foraging as it colonises in woodlands and is not difficult to spot. Children love exploring and as wild garlic so often grows near bluebells, you’ll have your wee ones enraptured by the offerings of the great outdoors. You just have to make sure you’re picking the right plant (and not the deadly Lily of the Valley or similar, whose leaves are not unlike wild garlic), however, snapping a leaf and smelling it helps, as does a pocket guide like the excellent ‘Food for Free’ by the formidable Richard Mabey. 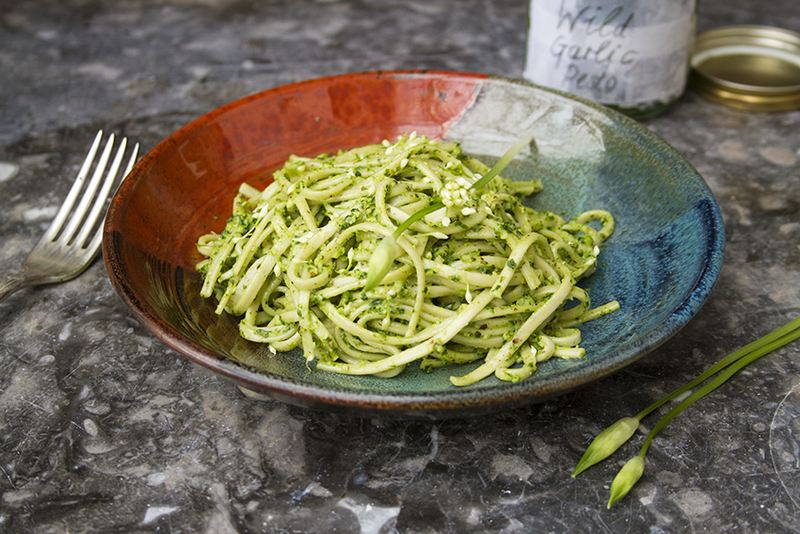 My children adore this pesto on spaghetti and it gives me great pleasure to see them scoff a bowl, with some steamed broccoli thrown in, what with the proliferation of snot we have seen in recent months. This is an incredibly easy and delicious recipe, and can be made in advance as it stores well. 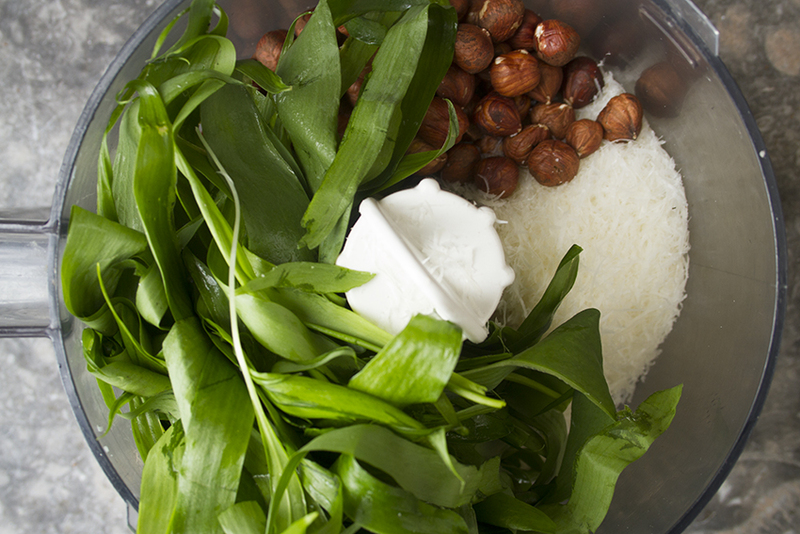 Put the wild garlic leaves into a mixer, along with the roasted hazelnuts and grated parmesan cheese. 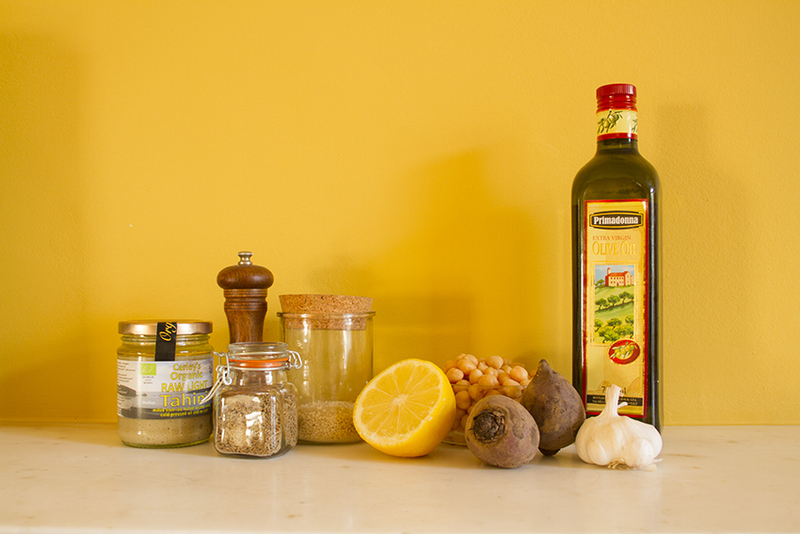 Blend until you have a smooth but still slightly coarse paste and then, whilst blending, pour in the olive oil. Season with salt and pepper to taste. … and if there’s any left over store in the fridge for up to a week in a air-tight container covered with a splash more oil. Every Wednesday, the mother-in-law welcomes a meditation group into her home. This small, quiet gathering of mostly women centres itself in the living room of the house bringing with it a humming, wombish equanimity that soothes the middle of the week, when the infant residents are peaking in their puissance and my maternal stability threatens a wobble. One of the abhyasis (practicants) is Edna, a lovely Israeli woman who runs Edna’s Kitchen, a local food company making incredible, authentic middle eastern food. She recently gave us a pot of her beetroot hummus to sample, which was so utterly moreish I just, well, had to make more. If we were to talk about food in terms of fashion, hummus would probably be placed somewhere alongside the Converse hi top. Outside their natural habitat (the Middle East/the basket ball court) they’ve been pop cult since the 1970s and have, in recent years, become so prolifically and commercially manufactured that everyone has eaten it and worn a pair, probably at the same time. Beetroot isn’t as trendy as kimchi or a pair of McQueen ‘bumsters’ (ok, so my knowledge of haute couture stopped somewhere around 1996) but it’s definitely not as common as sliced white or a Burberry umbrella. It’s also an amazingly versatile ingredient (try making beetroot and chocolate brownies, they’re bloody gorgeous) and incredibly healthful. Beetroot provides a rich source of strong antioxidants and nutrients, including magnesium, potassium, Vitamin C and sodium. It also contains betaine (which also gives it its crimson colour), a compound vital to cardiovascular health in that it reduces the concentration of homocysteine, a naturally occurring but harmful amino acid cysteine which contributes to the onset of heart disease and strokes. Recent studies have shown that it also helps to reduce blood pressure and increase stamina and performance (Lance, you should have hit the beets), and that betaine may protect against liver disease caused by alcohol abuse, protein deficiency or diabetes. Interestingly, beetroot has been used since the Middle Ages to treat illnesses of the blood. 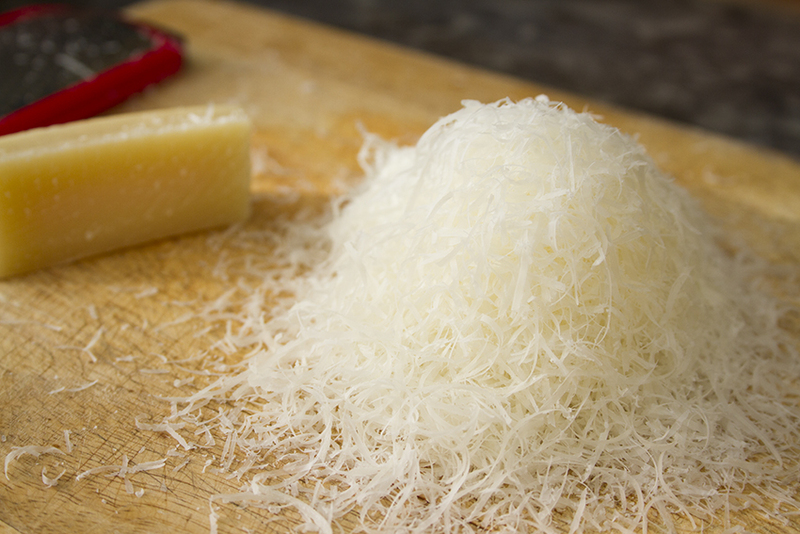 You definitely want to be eating this stuff. It’s also worth noting that beetroot is cheap as chips and environmentally friendly to boot – it’s best-suited to northern European climates, so perfect for British soil, and rarely needs treatment with pesticides. This red orb can do no wrong. 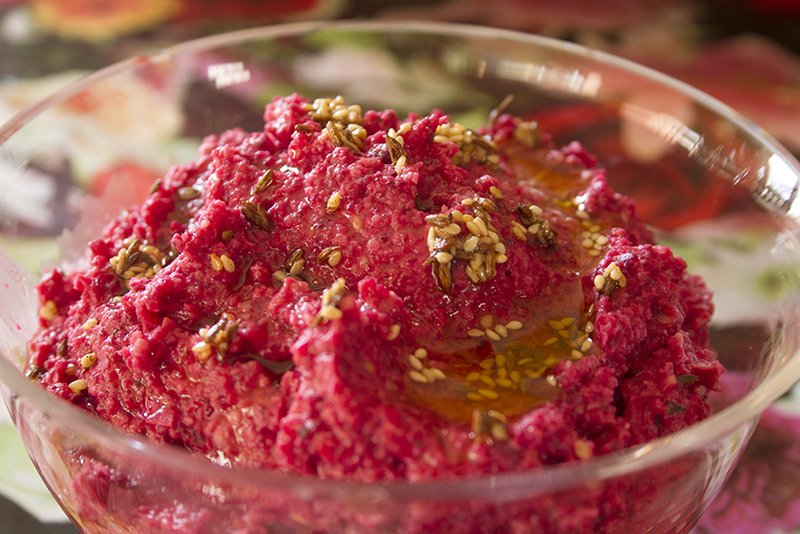 A super-quick and easy-peasy recipe (if you have a food processor), this spiced beetroot hummus is heavenly with fresh pitta (here’s my recipe for that). Although today I had mine slathered on rye with some home-cured salt beef brisket. To. Die. For. If using raw beetroot, wash before cooking and then cover with cold water in a saucepan. (It’s not necessary to peel the beetroot.) Bring to the boil and then simmer until tender (around 1 hour depending on the size of the beetroot). Drain and leave to cool slightly before handling so you can peel the skin; it should just come off under some cold running water. 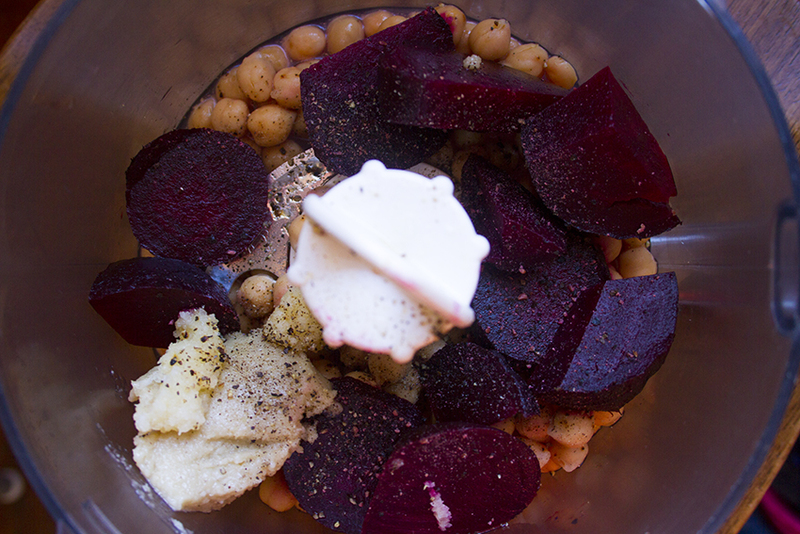 Once cooled, roughly chop up the beetroot and place in the food processor with the tahini, drained chickpeas, lemon juice and crushed garlic. Flick the switch and blend to a consistency that you are happy with (I like my hummus smooth). You should have a beautiful, light crimson-coloured paste. 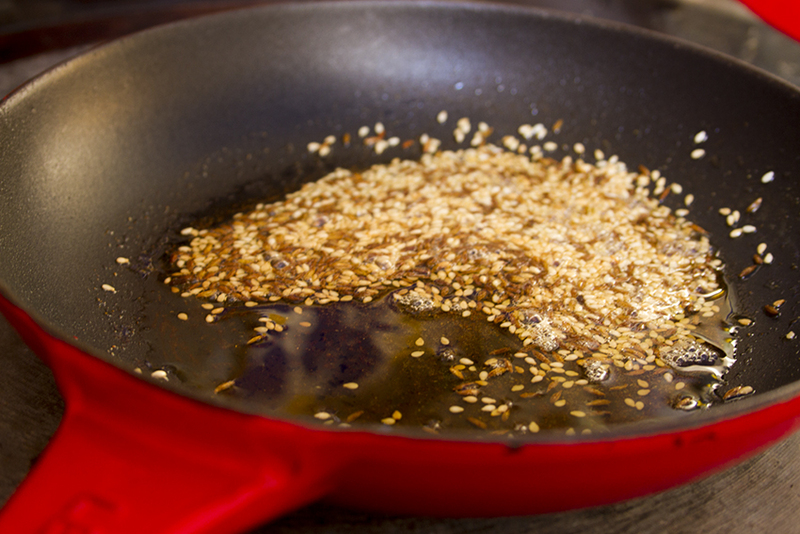 In a heavy-bottomed frying pan, heat the olive oil and then add the sesame seeds, cumin seeds and coriander. Fry, stirring continuously with a wooden spoon, for no more than 2 minutes making sure that the seeds don’t catch and burn. Remove from heat and add about two-thirds of this oily seed mix to the blender, along with some freshly-milled black pepper and salt (if you use). Whiz up again for a moment. Spoon the hummus out into a dish and put the last third of the oily spice mix on the top. Eat. The hummus should store for a good few days in the fridge, unless you’re my family and it goes in a few minutes. Perfect sprinkled on your pitta and hummus, or used in any number of delectable dishes, za’atar is a heavenly Middle Eastern condiment made from fresh, dried and toasted ingredients. In the Levant, it is thought that za’atar keeps the mind alert and the body strong. Whilst historically, the medieval rabbi and physician, Maimonides, prescribed this condiment for its health-giving properties. Toast 4tsp of the sesame seeds and all the caraway seeds together in a dry pan on a high heat for a couple of minutes. 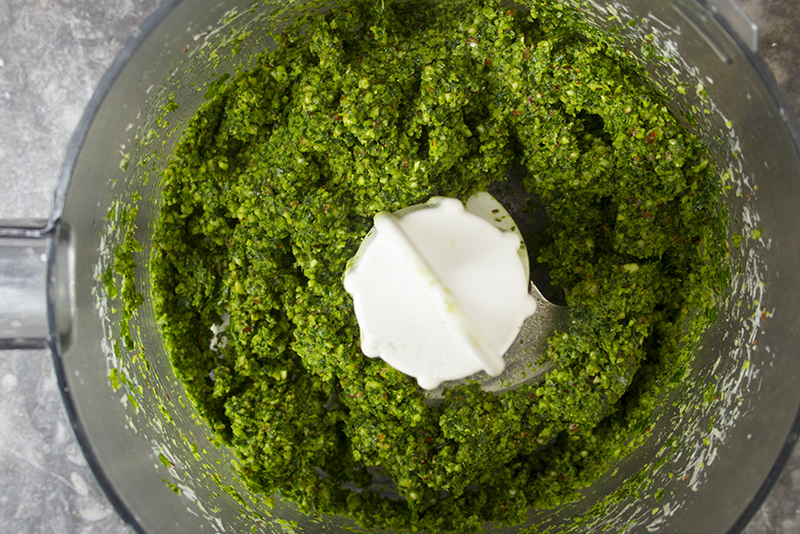 Then – using either a pestle and mortar or a blender – finely grind together until you have a dusty mix. Add the remaining tsp of sesame seeds to this fine mixture, for aesthetics! 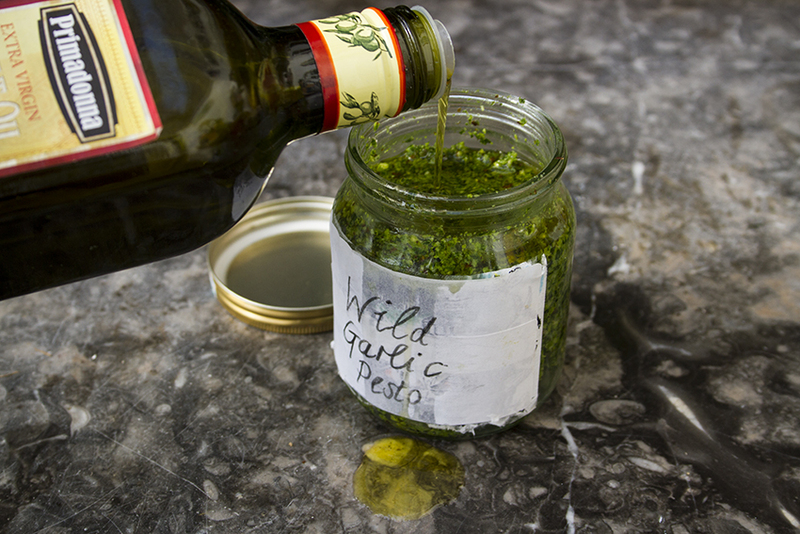 Your za’atar will keep in a jar in the fridge for a good few weeks.